The eBook and audiobook of Requiem for the status quo will continue to be available on Amazon until the end of 2019. I am going to self-publish the paperback version through my publishing arm, Words Matter Press so as of March 1, 2019, you will not be able to purchase a paperback copy for your bookshelf until Words Matter Press’s Spring 2019 release on Amazon. In the meantime, the Amazon paperback price for the month of February has been reduced so those who want to add this book to their library can do so at a discounted price before supplies run out. If you are a Prime member, shipping is FREE! Let these recent reviews encourage you to get your copy today! Rubies My mother recently died from Alzheimer’s, and I could really relate to everything she wrote about. All her information is very accurate, and I felt like she was on the journey with me. Vicki T. Olson draws in the reader, introducing us to the Quinn family, including protagonist Colleen, daughter and primary caregiver for Patrick, her beloved father, diagnosed with Alzheimer’s disease. The author deftly weaves together the stages of this dreadful disease throughout her fast-paced narrative and in so doing, educates us on the progression of this always fatal disease. The characters are down-to-earth and believable, the story sprinkled with both humor and the pain of loss. A must-read for any caregiver whose loved one has been diagnosed with dementia. Ann H. Irene Frances Olson does not flinch from the specific cruelties of Alzheimer’s disease in this novel, and I admire that very much. It is devastating to lose someone you love, bit by bit; devastating to watch them struggle to think as their brain is constricted by plaques and tangles. That said, this is also the story of how taking on the role of caregiver can be incredibly meaningful, even though it is also impossibly exhausting. In this case, an adult daughter is caring for a father she loves, and their mutual affection is made very poignant by the toll of the illness. This entry was posted in 21st Century Living, Alzheimer's/Dementia, Caregiving, Family issues, Novel Updates, Writing Updates and tagged Alzheimer's, Alzheimer's and dementia, Alzheimer's disease, Baby Boomers, Caregiver Support, Neurological Disorders, Requiem for the status quo. Boy do I have a book for you. The paperback of Requiem for the status quo is discounted until the end of February. For only $13.95, you can add this book to your To Be Read (TBR) list! If the Ebook is more to your liking, it is currently just $4.99 or free to Amazon Unlimited subscribers. It will always be available, but the paperback will not be, at least until later this year. This entry was posted in 21st Century Living, Alzheimer's/Dementia, Caregiving, Community outreach, Personal Struggles, Writing Updates and tagged Alzheimer's, Alzheimer's and dementia, Alzheimer's disease, Baby Boomers, caregiver stress, Caregiver Support. Hurry while supplies last! Discounted price! Requiem for the status quo was picked up by a publisher two years ago this month. The eBook and audiobook will continue to be available on Amazon through Black Rose Writing until the end of 2019. I am arranging for different publishing options for the paperback version, however, and will be releasing that paperback later this year. Jill W. I’ve never written a review when I’m only halfway through a book, but I wanted the author to know sooner rather than later, how much her book has affected me emotionally. My family has been dealt the dreaded card of dementia so reading REQUIEM FOR THE STATUS QUO has been difficult since we’re living Coleen and Patrick’s nightmare now. I find myself only able to read pieces at a time because the author has done a superb job of making Patrick and his family’s battle with this horrible disease, so real. Last night as I read, I found myself laughing and then crying. This book is a must read for anyone touched by Alzheimer’s or dementia. Ann C. Irene Frances Olson writes believable fiction. Her characters are kind, funny and endearing — even in their flaws. When Colleen takes over her father Patrick’s caregiving because of his advancing memory issues, the reader can’t help but be moved by the tender relationship between them. The effervescent Colleen finds herself in a challenging life situation — pulled between her father’s condition, her working life, her brother’s disdain for her father’s illness and her own desire for companionship. Having experienced the devastation that Alzheimer’s can bring to a family, it was both heartbreaking and a joy to follow Colleen’s path. Yes, there was loss, but the author helps us see the beauty and courage in facing the inevitable challenges of aging and how it’s possible to do it with grace and love. Jason This book is about the many faces of Alzheimer’s, from those how bear the thief in their brain to those who must cope with and care for loved ones. The story is straightforward and written with love, it is a daughter’s anthem of love for her father while also being a support for others facing the journey of incremental loss. Colleen describes it best when she identifies Alzheimer’s as a thief robbing us of our memories and our future. If you or a loved one are walking this journey, this story is sure to give both a sense of how to make this journey possible and how to mourn with others on the path. This entry was posted in 21st Century Living, Alzheimer's/Dementia, Caregiving, Family issues, Health & Wellness, Personal Struggles, Quality of Life and tagged Alzheimer's, Alzheimer's and dementia, Alzheimer's disease, assisted living, Baby boomer, Caregiver, Caregiver Support, caregiving, solo caregiving, struggles of caregiving. 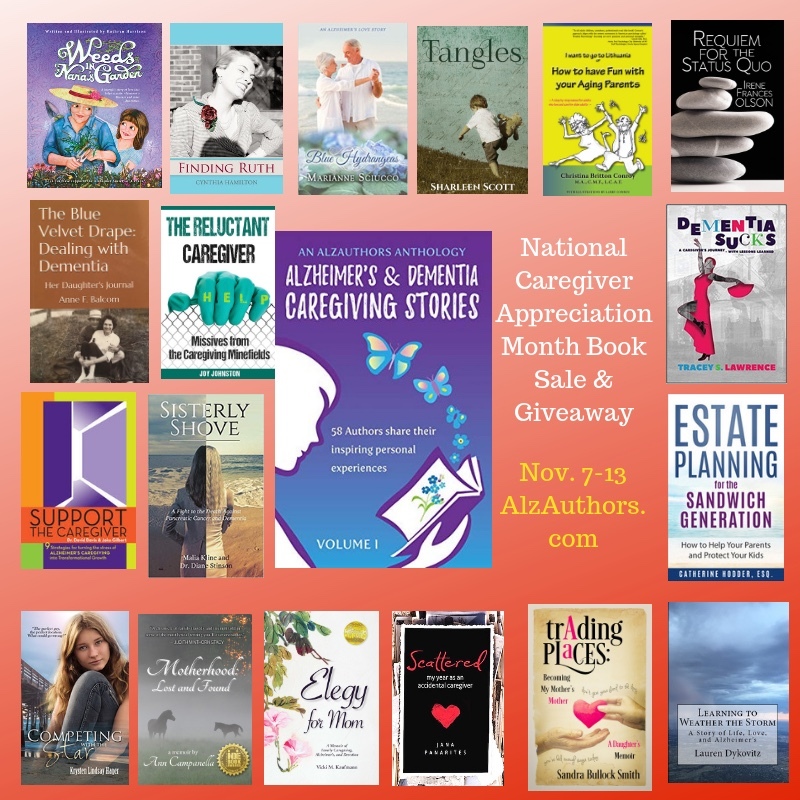 All of the books shown in this graphic are part of the AlzAuthors Caregiver Appreciation week-long sale, starting today, November 7th. You’ll see my novel, Requiem for the status quo, in the upper right corner that is priced at 99 cents from Nov 7th through 13th. To link to all the books you see above, click on the AlzAuthors link here. Simply click on the book’s image and it will take you directly to its page on Amazon, making it extremely easy to purchase as many titles as you please. And don’t forget to gift others with titles as well. It’s so easy to do and the recipients of your gifts will be so pleased that you’ve thought of them. This entry was posted in 21st Century Living, Alzheimer's/Dementia, Caregiving, Community outreach, Family issues, Health & Wellness, Personal Struggles, Quality of Life and tagged Alzheimer's, Alzheimer's and dementia, Alzheimer's disease, Baby Boomers, Caregiver, Caregiver Support. I have been closely involved in matters regarding Alzheimer’s disease and other dementia for eighteen years now: long-term care (LTC) housing, memory care, Alzheimer’s support group facilitator, and Washington State LTC Ombudsman. But it took me becoming a published author of a novel that focuses on a family’s Alzheimer’s disease experience before I finally found my Alzheimer’s community. AlzAuthors is a group comprised of over 170 published authors (as of this writing) who have published fiction and non-fiction books reflective of their personal Alzheimer’s experience. The six members of the AlzAuthors Management Team (Team) is the Alzheimer’s community about which I speak. We can sing a lonely song, or form a choir and create harmony. Without exception, the authors featured on our site and each member of our Management Team had the experience of struggling with the learn-as-you-go-task of caring for someone with cognitive impairment. We all made mistakes, and we learned from them, but we also had successes, and we celebrated them. As a recent addition to the AlzAuthors Management Team, I became even more convinced that my personal Alzheimer’s community resides within this group. The support, the kindness, the giving nature reflected within the Team is incomparable in my experience, and we are not just keeping it to ourselves. AlzAuthors is spreading their influence into numerous parts of the world…which is kinda why they asked me to join the team as their Global Outreach Coordinator. The six of us know our presence is evident in more countries than just the United States, but our imagination and passion is boundless so we have set out to become a household word in small and large communities throughout the world. 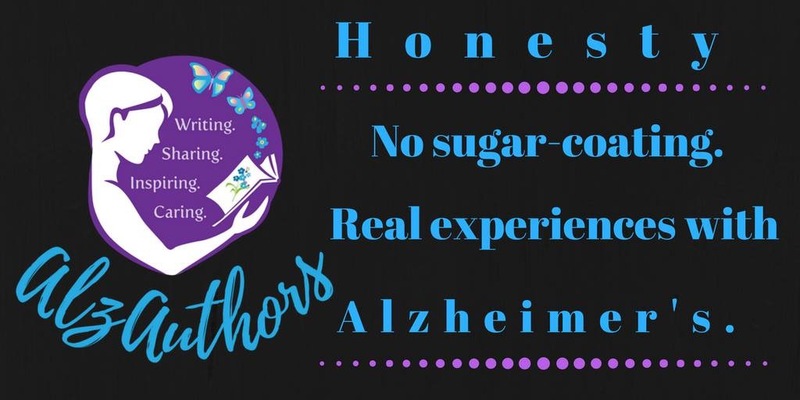 Why AlzAuthors? Because this 100% volunteer group has brought together some of the best books on Alzheimer’s and other dementia in one central location: our bookstore. We’ve categorized those books to make the personal caregivers’ or professionals’ shopping experiences an easy one with categories such as: Caring for Parents or Grandparents, Caring for Spouses or Partners, Living with Dementia, and Children and Teen books, to name a few. We know a caregiver’s “free” time is limited or non-existent, so we’ve done our best to make their shopping experience an easy one. They simply click on the cover of the book they’re interested in and they are taken directly to Amazon to make the paperback, eBook, or audiobook purchase. We’re working hard so you don’t have to. We have experienced the loss of a loved one with dementia. We know the pain of being forgotten. We all have witnessed decline. We have provided countless hours of caregiving. We know many others have experienced the same and we believe in the power of sharing those stories. This entry was posted in 21st Century Living, Alzheimer's/Dementia, Caregiving, Community outreach, Family issues, Health & Wellness, Personal Struggles, Quality of Life, Retirement, Senior Housing, Writing Updates and tagged Alzheimer's, Alzheimer's and dementia, Alzheimer's disease, Baby boomer, Caregiver, Caregiver Support, caregiving. I was asked to write a story or two for an anthology of short, short, stories that would be read to seniors with cognitive impairment. I jumped at the opportunity. That anthology, The Mighty Ant, is now available in paperback on Amazon. I am one of 33 contributors to this collection of short stories for seniors who suffer from dementia and other related memory or cognitive disorders. This book is the culmination of a project from editor and contributor, Jessica Bryan, who is a caregiver and advocate for caregivers. Several years ago she began to notice that her mother, who suffers from Alzheimer’s disease, lost focus and could no longer read lengthy books. Jessica began reading to her mother and found that simple, short stories were easier for her to understand. The Mighty Ant is filled with these kinds of fiction and non-fiction stories. The proceeds from the sales of the books will be donated to a local Council on Aging. The generous contributions of authors like myself have come from all over the world. The result is a book with different perspectives, reminiscences, and tales that reflect not only local culture, but a variety of customs, ethnicities, and lifestyles. I am honored to have my two stories titled, A Neighborly Friendship and A Sweetheart of a Story included in this collection. A Sweetheart of a Story was selected as the final story in the book because the editor felt it was the perfect selection to provide a sweet ending to the anthology. Buy a copy or ten or more for yourself and others…perhaps your local memory care community would love to include the reading of this book to their senior activity schedule! Currently only $12 for this 322-page large print storybook. This entry was posted in 21st Century Living, Alzheimer's/Dementia, Caregiving, Community outreach, Family issues, Health & Wellness, Personal Struggles, Quality of Life, Senior Housing, Writing Updates and tagged Alzheimer's, Alzheimer's and dementia, Alzheimer's disease, assisted living, Baby boomer, Caregiver Support, caregiving.